A 20-year-old driver named Lewis Hamilton recently got sentenced to eight months in jail and a temporary ban from driving after a police chase in March, according to the Daily Star. He’s not the Lewis Hamilton most of us are familiar with, not that the Daily Star’s headline would’ve keyed you into that. That’s because, as pointed out by ESPN’s Nate Saunders pointed out on Twitter, the Daily Star published its story Friday on the non-famous Hamilton with the headline “Lewis Hamilton JAILED for driving like a ‘lunatic’ in snowy police chase.” This person is not Lewis Hamilton, the four-time Formula One World Champion. It another Lewis Hamilton. The story even has “Formula One” in its URL, and of the three related stories published at the bottom of it, two of them are about the F1 driver Hamilton. The other is about the F1 championship standings, which Hamilton is leading. 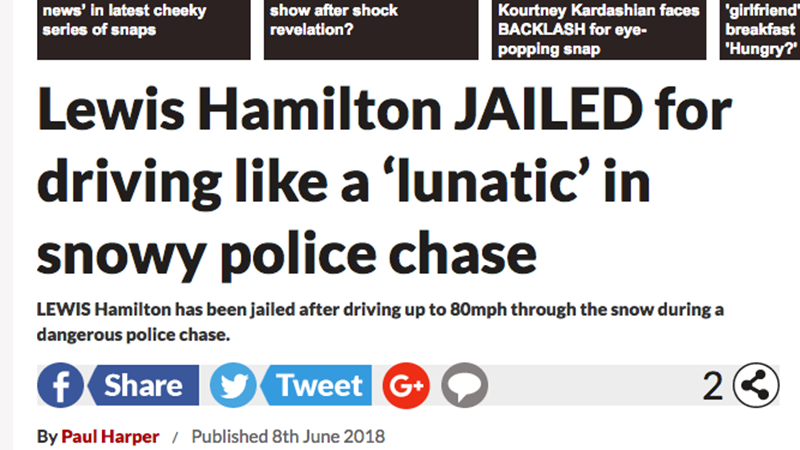 The non-famous Hamilton was, according to the story, driving without a license or insurance during the nine-minute police chase, during which he was said in court to have ran red lights and driven the wrong way in two roundabouts. The story never explicitly says that this Hamilton is not F1’s Hamilton—that has to be concluded from the fact that it says the person involved is 20 years old, from Grangetown in Wales, and that his defense attorney said he “could make something of himself” with his good work ethic. Not that this should justify people dodging or maligning the media in general. Unless they’re pestering Max Verstappen for crashing all the time. Please, he’s been through enough.